Ise Kadoya Cardamom Porter is an 8% spiced porter from Ise Kadoya, based in Mie, Japan. It’s part of their winter seasonal range of beers and was first released in 2016, as a push towards the Valentine’s market. Ise Kadoya Cardamom Porter is brewed with orange peel, cacao powder, and also cardamom, which happens to be the world’s third most expensive spice, behind saffron and vanilla. It also has a IBU of 35 to take some of the sweet edge of the beer off. Not as curry like as I thought it would be. Ise Kadoya Cardamom Porter poured out a thick black colour with no indication of sediment, and was topped off by a slight tan-coloured head that quickly faded to an oily layer on top with some bubbles around the outside. It had the unmistakeable aroma of cardamom (I really want to write cardamon there!) though thankfully it was subdued. If you’ve ever had the Ballast Point Indra Kunindra beer, then you know what curry in a beer would smell like. 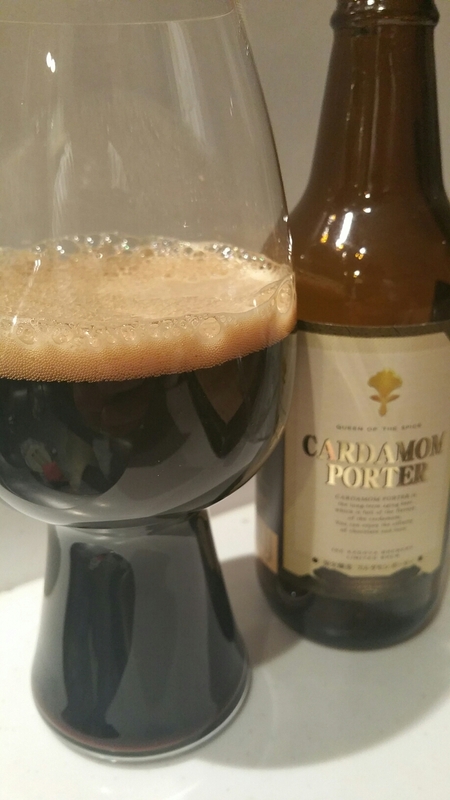 Ise Kadoya Cardamom Porter avoids that problem but still, I couldn’t forget that aroma. There was also hints of coffee, chocolate, with a brief appearance of orange peel too. Drinking Ise Kadoya Cardamom Porter cold is doing it a disservice, so please let it warm up a bit. Read one of our reviews on Ise Kadoya or do something else, but whatever you do, let Ise Kadoya Cardamom Porter warm up before drinking. The cardamom was balanced nicely with the rich chocolate and coffee flavours, though it kind of reminded me of a Terry’s Chocolate Orange. If you’ve never had one of those, go try one and add some cardamom powder on top. Ise Kadoya Cardamom Porter was also surprisingly smooth and well-rounded for an 8% beer, with only a faint hint of booziness. It finished off with the cardamom flavour lingering on the palate – far longer than the other flavours. If you like cardamom, then you’ll enjoy Ise Kadoya Cardamom Porter. It’s a strong flavoured beer that is well balanced though that may be too much for some. Are you saying you didn’t like Indra Kunindra?? I thought it was great. I also put cardamom in my coffee these days.